The nice thing about this is 1) your kids can help you make these and 2) flavoring the meat before cooking means no dipping sauce is required. They also freeze very well, but be sure to put waxed paper between layers so that they don’t stick to each other, and so that you can defrost as many or as few as you need. So you can fry, steam or drop into soup. I do this as a 2-day project because I cook and cool the filling before stuffing, but this is not required. If you don't pre-cook the filling it can be done in a couple of hours in an afternoon. 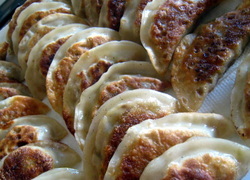 There are two variations here--one with ground pork and one with ground chicken. Soak shiitake in hot water until soft (about 45 minutes). Cut of the stems and finely chop the caps. Mix everything well. Add shoyu, oyster sauce and chili oil (or sesame oil and chili/garlic combo). Drizzle a bit of sesame oil and canola oil into a pan. Cook filling, using the back of a spoon or spatula to break up the meat. Turn up the heat at the end to reduce down any pan juices. Dump into a bowl and cool it down completely. Drop a spoonful into the wrapper. Fold over pinch up the edges. To cook, add some canola oil in a pan with a dash of sesame oil. Fry until brown and crunchy and flip. Add just enough chicken broth to cover the bottom of the pan, cover and let it steam for a minute or so.